This is the largest owl species in the world. Large females can have a wingspan of up to five feet. 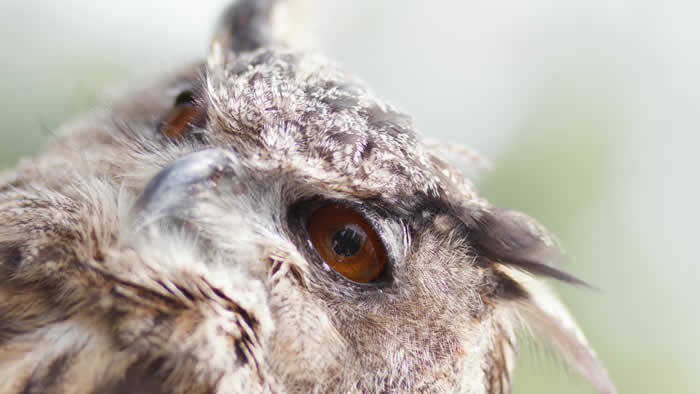 Smaller mammals such as mice and voles are a common prey item, but these owls will eat anything they can catch. Eurasian Eagle owls have a very large distribution. They are found across Europe and Asia, and will even migrate into Africa to breed. They are noticeably absent from Japan and the British Isles. 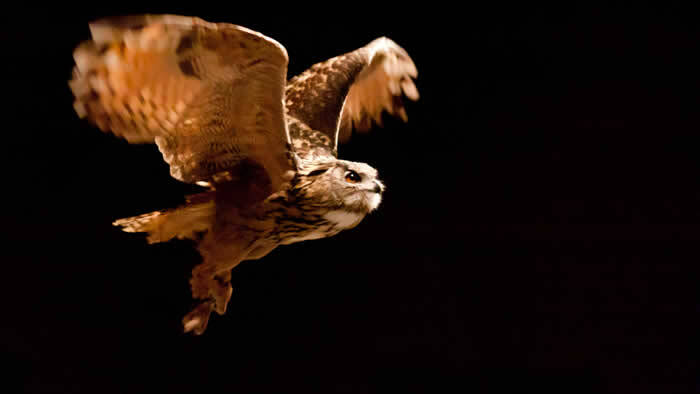 A skilled night-time hunter, Eurasian eagle owls have silent flight, excellent vision and superb hearing. Globally, this owl is in the category of least concern for extinction because of its wide range. However, hunting pressures have led to endangered populations in some areas. hatched in May of 1990 at the Lion Safari in Ontario, Canada, and was acquired by the Minnesota Zoo at four months of age. He has been used in both the outdoor and indoor shows since 1991. As the bird show has grown in recent years, Orville has been used mainly during indoor shows. A highlight of the winter season, Orville makes a great impact because of his large size, low flight and bright orange eyes. In the summer, he often molts and so is presented on the glove for zoo camp groups for demonstrations. He also makes an appearance with a trainer at the end of most summer shows so the audience has the opportunity to see him close up and ask questions about him. Eurasian eagle owls have been known to capture roe deer that are close to four times their own weight!